I'm sure I wouldn't be the only commuter to admit that after a few drinks at work sometimes my sense of location (on trains between stations) would be slightly inaccurate, by about twenty or so miles. I would continuously fall to sleep then wake up after a few minutes thinking I'm somewhere I'm not. Luckily, when I used to commute to London, my station (Shoeburyness) is at the end of the c2c line and the security guards used to wake me should I be out of it. Unfortunately, not everyone shares the same luxury as myself and whether under the influence of an adult beverage or not, sleep can often be the cause of missing a desired stop. This is a real pain should you be on a long distance line - for example London Kings Cross to Glasgow in Scotland and the distance between stops is massive. So what can your Windows Phone 7 do to help you out? 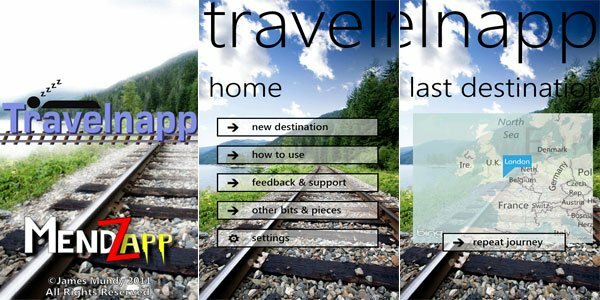 Allow me to introduce Travelnapp by Mendzapp. Read on past the break for the full walkthrough and review of Travelnapp. Developed by James Mundy, Travelnapp does exactly what it says on the tin (and works anywhere in the world where GPS is available). It allows one to fall asleep while traveling and then alerts the user through an alarm and vibration when a GPS set location is close by. Highly customizable in regards to map styles, distance units and alert distance. Eye catching yet simple design and layout. Relies on GPS signal so will still track you even in areas with no cell coverage. Optimized to avoid draining your battery. Will work at any destination worldwide where access to GPS satellites is available. Journey statistics and route plotted. Has the ability to automatically stop your music and notify you of destination arrival. The functionality of the app is so simple that it doesn't require explaining at all. You set a GPS location on an interactive map and allow the app to do the rest. The great thing about selecting a specific location is that due to the background being a railway line, one would expect the app to cater for commuters on main intercity lines but you can literally pin the marker anywhere, even in the middle of an open field should you so wish it. 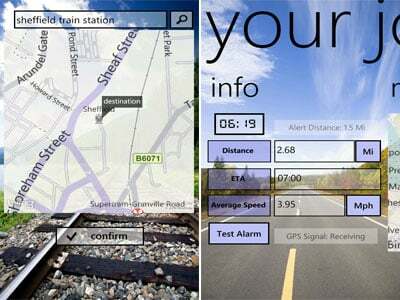 This makes the app useful for car and coach journeys too. Accompanying the info pane is a map showing the user's current location (green) and the alarm set location (red). Nice little touches include the developer has made it possible to lock and unlock this map so the user doesn't navigate the map instead of swiping the pivot, which can get irritating. Also, after you've punched in a destination, on the app home screen you can swipe to the left to view the previous location for easy repetition. What do I love most about Travelnapp? The simplicity, the idea behind the development and the ease-of-use. What don't I like? I'm not too fond of the UI, could use some working on, but other than that I would strongly recommend this app to any traveler. Check out our visual run through in the video below. 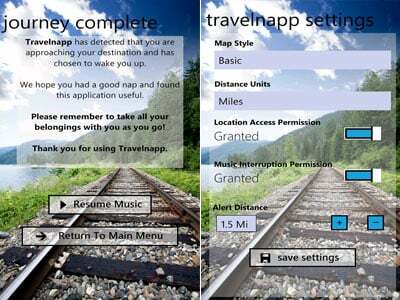 You can download Travelnapp (Zune link) from the Marketplace for absolutely nothing at all.